Come and discover this unique city on the ocean. 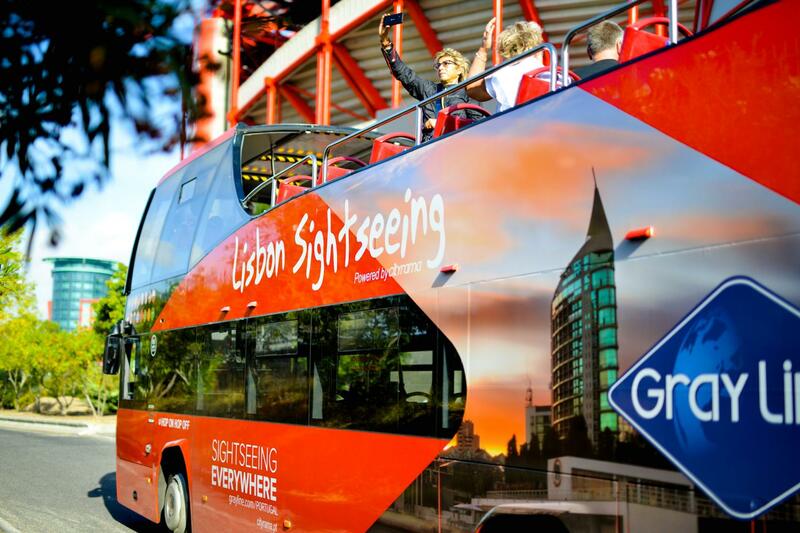 Hop on one of our red buses and enjoy the best sightseeing the city has to offer. With the 48-Hour Tour you can hop-off at any of our 54 stops on 3 of our 4 lines: Belém, Oriente, Castle & Cascais Lines to visit museums, shops, discover typical old quarters, or have lunch. Then Hop-on again, as many time as you want! Castle Line: An unique opportunity to unveil the mysteries of the oldest quarters of the city such as Alfama and Castelo. Drive through its narrow streets and see the low houses in these local neighborhoods. Admire the breathtaking views of the city from the lookout at the Portas do Sol and from St. George's Castle viewpoint. Enjoy a delicious meal while watching a Fado live show - Lisbon's soul and song. Major Sights/Stops: Marquês de Pombal, Parque Eduardo VII, Avenida da Liberdade, Restauradores, Rossio, Comércio Square, Casa dos Bicos, Fado Museum, Portas do Sol, Lisbon Cathedral, Alfama, St. George Castle, St. Vincent Church, St. Anthony Church/Museum, Design & Fashion Museum. Belém Line: Travel through the main avenues and the city centre to the monumental quarter of Belém, where many of the monuments and museums are connected with the Portuguese seafaring past. Including UNESCO World Heritage Sites Jeronimo’s Monastery & Tower of Belem. It's also the best place to try the famous "Pastéis de Belem", a Lisbon typical sweet pastry. Major Sights/ Stops: Marquês de Pombal, Avenida da Liberdade, Restauradores, Rossio Square, Comércio Square, Cais do Sodré, Coach National Museum, Archaeology National Museum, Naval Museum, Berardo Museum, Jerónimos Monastery, Belém Tower, Monument to the Discoveries, Alcântara/Docks, Ancient Art National Museum, Oriente Museum, Basílica da Estrela, City Museum, Electricity Museum, St. Anthony Church, Fernando Pessoa House, Saldanha, Campo Pequeno, Calouste Gulbenkian Museum, El Corte Inglés, Parque Eduardo VII,Design & Fashion Museum, Puppet Museum. Oriente Line: Travel along the Tagus River until Parque das Nações, which was the host of the Expo 98. Here, in the most modern part of the capital, you can find numerous attractions, namely the Zoo, the Casino, the Oceanarium, the El Corte Inglés and Vasco da Gama Shopping Malls, beautiful gardens and a long riverfront promenade. At the end of the day, hop off at the cheerful Chiado and/or Bairro Alto neighborhoods for a drink and a relaxing time. Major Sights / Stops: Marquês de Pombal, El Corte Inglés, Twin Towers, Lisbon Zoo / Sete Rios, Oceanarium, Lisbon Casino, Vasco da Gama Shopping Centre, Vasco da Gama Tower, Gare do Oriente, Poço do Bispo, Tile Museum/ Madre de Deus Convent, Estação de Santa Apolónia, Museu do Fado, Casa dos Bicos, Rua do Comércio, Chiado, Bairro Alto, Príncipe Real, Botanical Garden, Water Museum, Military Museum, St. Roque Church/Museum , National Pantheon. Cascais Line: Discover the beautiful city of Lisbon and the magnificent scenery of Costa do Sol. Enjoy the sandy beaches, ideal for relaxation or playing sports. Immerse yourself in the beauty and history of places like the town of Cascais and Estoril. Finish this tour admiring the contrast between the white sand dunes of Guincho beach and the foothills of Serra de Sintra. Apr-Oct from Lisbon 10:15 AM, 11:15 AM, 12:15 PM, 3:15 PM, 4:15 PM, 5:15 PM. From Cascais 10:15 AM, 12:15 PM, 1:15 PM, 3:15 PM, 5:15 PM, 6:30 PM. Nov-Mar from Lisbon 10 AM and 3 PM; from Cascais 11:45 AM and 4:45 PM. Major Sights/ Stops: Marquês de Pombal, Carcavelos, Estoril Casino, Cascais Bay, Guincho (Oitavos Fort 1. ), Guincho (Porto de Santa Maria Restaurant 2. ), Guincho (Orbitur Campism Site 2. ), Cascais (Boca do Inferno), Casa das Histórias Paula Rego (Cascais), Monument to the Discoveries, Jerónimos Monastery, Berardo Museum, Naval Museum, ArchaeologyNational Museum.